In the UK there is plenty of heat energy to be harvested; it just doesn’t all come at the right time. Ideally you save all the surplus heat that comes along and then use it when there is a shortage. At one extreme is the interseasonal heat store such as was successfully used for many years at the visitors’ center and bookshop at the Centre for Alternative Technology. This approach allows for a huge storage capacity and can result in storing enough heat during the summer to last all winter. It also requires a very large water tank! At the opposite end is decrement delay which traps some of the heat which enters walls and roofs during the day and lets it back out into the house at night. This requires careful design of the building fabric and is still not well understood. See more on decrement delayThis relates to the lag time that insulation itself takes to heat up or cool down. It introduces a delay into the effect of the insulation. This can help level out peaks and troughs of temperature. See the section on Decrement Delay. Another approach is shear thermal massthis is about how much heat something can absorb - so it involves its specific heat capacity and its volume. It can be useful for levelling out the peaks and troughs of temperature within a house. See the page on thermal mass which exploits the property of heavyweight building structures to absorb surplus heat when it is there and give out the heat later when needed. This is similar to decrement delay but simpler in principle. However, as with decrement delay, the fabric can only go on absorbing (or releasing) heat for so long, usually a day or three, after which time there is no benefit. This contrasts with the interseasonal heat store not only because the interseasonal one is very much larger but also because it is remote from the structure so the heat can be locked away from the building until needed. 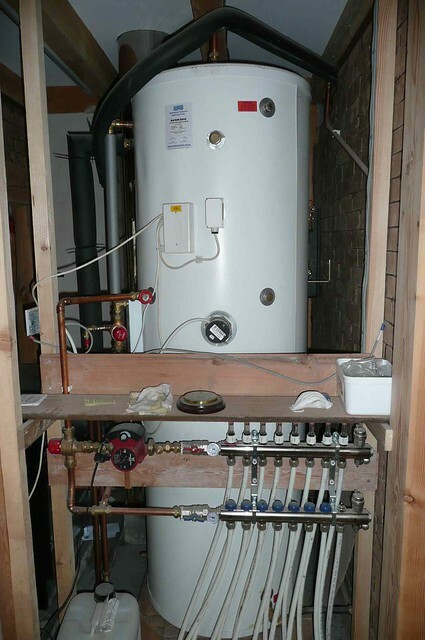 Many owners of wood burning boilers (logs, rather than chips or pellets) and large thermal solar collectors are starting to incorporate a large insulated hot water store (in the region of 500 to 2000 liters – depending on the size of stove and house) into the system so that the timber can be burned hot and fast (which is the cleanest, most efficient and easy way to burn timber). With a well insulated house this means that the stove may only need to be lit a couple of times a week in winter. In the case of solar collectors the heat captured on a long sunny day may last for several more days. Heat stores can also be made to work in conjunction with solar water heating. There is an interesting thread about this on the Navitron forum. Ground source heat pumps are powered by electricity and it may be more efficient to run them at night on the cheaper Economy 7 metering and save most of the heat in a heat store to use the following day. This make ecological sense as traditional electrical generation tends to be in surplus during the night time compared with the day. Well the best approach is of course to be so well insulated that you don’t need a heating system. This is what the PassivhausSee more on the Passivhaus standard. The PassivHaus Institute has pioneered a standard for low energy buildings. It includes very low energy usage and ways of achieving this. The word is derived from the idea of buildings which are fundamentally low energy and passive solar heated rather than using extra gadgets to heat them. See Passivhaus for the UK branch of the organisation. standard is all about.